The Korea Student Aid Foundation (KOSAF) in Seoul, Korea, won two Gold Stevie® Awards in The 2013 International Business Awards: in the marketing awards categories with their National Scholarship PR Campaign; and for Best Twitter Feed. 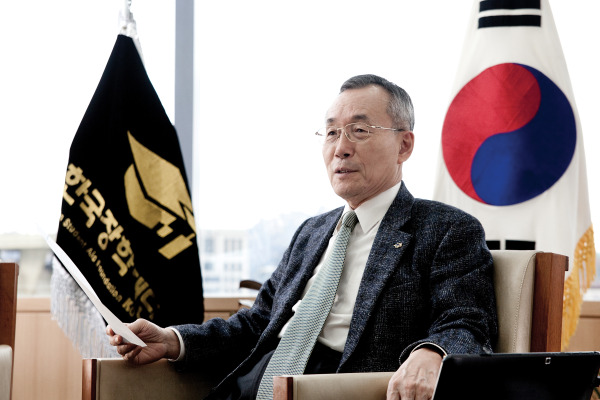 We talked with Mr. Byong-Sun Kwak, Chairman of KOSAF, about what winning Stevie Awards has meant for his organization. We asked Kwak how The International Business Awards (IBAs) could be of help in broadening support for Korean students and their post-graduate careers in countries outside Korea. Since Mr. Byong-Sun Kwak was appointed chairman of KOSAF in May of 2013, he has greatly expanded national scholarships to lower the burden of college tuition – and to free college life of worries about tuition fees – by creating the “conversion loan” program and others which substantially cut the existing borrower’s loan rate, along with the stabilized operation of the college student loan. He was awarded the Happiness Deoham Contribution Grand Prize in 2014 for his contribution to society, and he also faithfully fulfills his own social obligation by donating 50% of his private income mainly to scholarship funds. Before joining KOSAF, Kwak was president of the Korea Education Development Institute (KEDI); a member of the Presidential Commission on Education Reform, Republic of Korea; a member of the Board of Education Sub-Committee of UNESCO Korea; a member of the Presidential Commission on Education and Human Resource Development; and he served as a President of Kyungin Women’s University. He has been awarded the National Medal of Merit from the Korean Government (1986), National Medal for Excellent Service from the Korean Government (2003), and the Pacific Circle Consortium’s Peter Brice Award. His major publications include Curriculum Theory and Textbook, Civil Society and Citizenship, and Search for an Educational Paradigm for the Future of Co-Existence and Cooperation with Focus on the East Asian Situation, among many others. Chairman Kwak graduated from the college of education at Seoul National University, and received a Master’s Degree in education at the same university. He also attended the College of Education at Marquette University graduate school in the United States, majored in education, and received a Ph.D. The Korea Student Aid Foundation (KOSAF) is a quasi-governmental agency under the Korean Department of Education. Its mission is to help anyone to be a capable human resource by operating the financial fund consigned by the government, by bonds issued on the capital markets, and the funds donated by enterprises or individuals. To achieve this mission, KOSAF implements projects such as a national scholarship for low-income students, a scholarship for academic excellence, a scholarship in conjunction with work programs, and a low-interest tuition loan project. Since its inception in May 2009, about 6 trillion Korean won (approximately of scholarships and over 20 trillion won of tuition loan has been supported, and up to 7.8% of the tuition loan interest prior to the organizations foundation has been reduced to 2.9% to ease the student’s burden. The foundation is also building boarding houses to lower students’ living costs, and operating a system which enables more than 400 celebrities to mentor the college students—and for those students in turn to help the studies of elementary, middle, and high school students. At present, about 30,000 college students who receive benefits from KOSAF are participating in the knowledge-mentoring program for younger students from low-income and multi-cultural families, as well as families that have defected from North Korea.